A cold front swept eastern and central provinces over the weekend, bringing sleet and snow to Shanghai and nearby cities, with meteorologists forecasting more of the same in the coming days. The National Meteorological Center issued a blue alert on Saturday, the lowest level in a four-tier warning system, for snow in some eastern and central provinces. Shanghai experienced intermittent sleet and snow over the weekend-its first snow of the winter-and a low temperature of about 2 C, the city's meteorological center said. Between Saturday night and Sunday morning, sleet reached 2.4 millimeters in Pudong New Area and 2.2 millimeters in Songjiang district, both records. The only snow was measured at 1 centimeter in Songjiang and Jinshan, the center said. Hangzhou, Shaoxing, Ningbo and some other northern regions in Zhejiang province had moderate to heavy snow on Saturday, and parts of its northwest area were hit by blizzards, according to the local meteorological center. 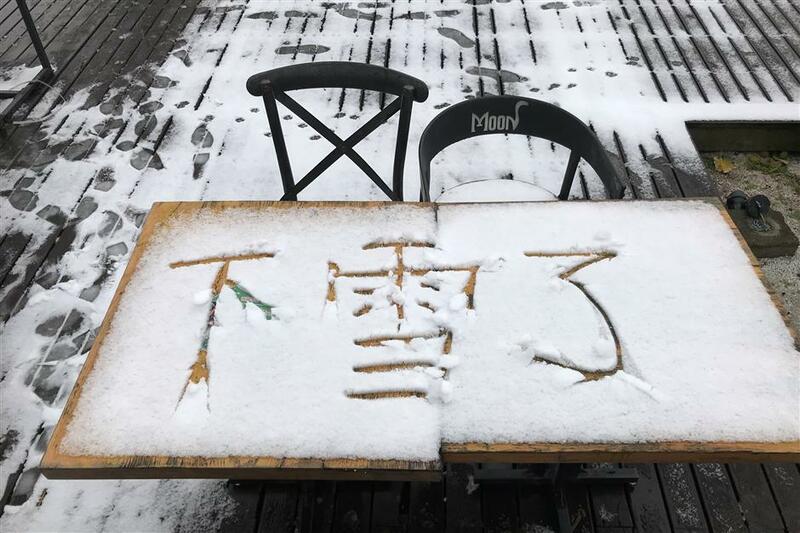 The snow depth in northern Zhejiang was between 3 and 8 centimeters, with 12 cm in Hangzhou, 6 cm in Shaoxing and 19 cm in parts of Anji county. Sleet also lashed Jiangsu province on Saturday, with the temperature in most areas plunging near or below freezing. But the hostile cold front did not dampen the spirits of the many citizens who ventured outside to witness the unusual snow. Videos and photos emerged on social media as rare snowflakes fell and accumulated in the Yangtze River Delta. No injuries or transportation delays from the harsh weather were reported as of Sunday. The National Meteorological Center lifted its blue alert for snowstorms on Sunday morning but said some regions, including northern Jiangsu, might see heavy snow on Monday. It later renewed its blue alert for cold while the temperature in most eastern and central provinces will remain low through Wednesday, plunging to around-3 C.
Because of the cold front, some regions in Zhejiang issued yellow alerts on Sunday for icy roads, according to weather.com.cn, the China Meteorological Administration's news portal. But the temperature will remain above zero in Shanghai and is expected to bounce back to 10 C on Thursday, in said. "Snow is not common in Shanghai during the winter, but it appears sometimes," said Wu Rui, chief officer at the Shanghai Meteorological Service. "Similar snow and sleet will not happen again in Shanghai and nearby regions in the short term, and the cold wave will pass after the weekend." Early December temperatures in Beijing also reached record lows for the past decade, according to a total of 11 national-level meteorological bases in the city, with-10 C on Sunday, according to weather.com.cn. Temperatures are expected to drop by 4 to 10 degrees in some regions of the Inner Mongolia autonomous region, North China and Northwest China, as well as in eastern China between the Yellow and Huaihe rivers, according to the national center.